After the July 15th failed coup d’état attempt in Turkey, the Bosphorus Bridge can no longer symbolize something as simple and optimistic as national modernity. A name as sedate as Bosphorus Bridge was not enough. It was a stage of the July coup attempt in Turkey. Binali Yıldırım, the prime minister, suggested that the bridge be renamed “July 15 Martyrs’ Bridge” to honor the approximately 200 killed in a failed attempt at a coup d’etat. One could be forgiven for thinking that this bridge, with its simple name, was Istanbul’s last apolitical space. A murky and poorly-executed military coup on July 15 meant soldiers closed the bridge’s motorways to the public. This led to a momentous counter-occupation six days later, long after the soldiers were arrested and led away. A bridge, the zenith of Turkey’s Cold War-era modernization project, was suddenly a public space like any plaza or monument. It was never supposed to be this way. The Bridge was supposed to be untouchable. Now it is tussled over like any other bit of brick, dirt or concrete in the city. 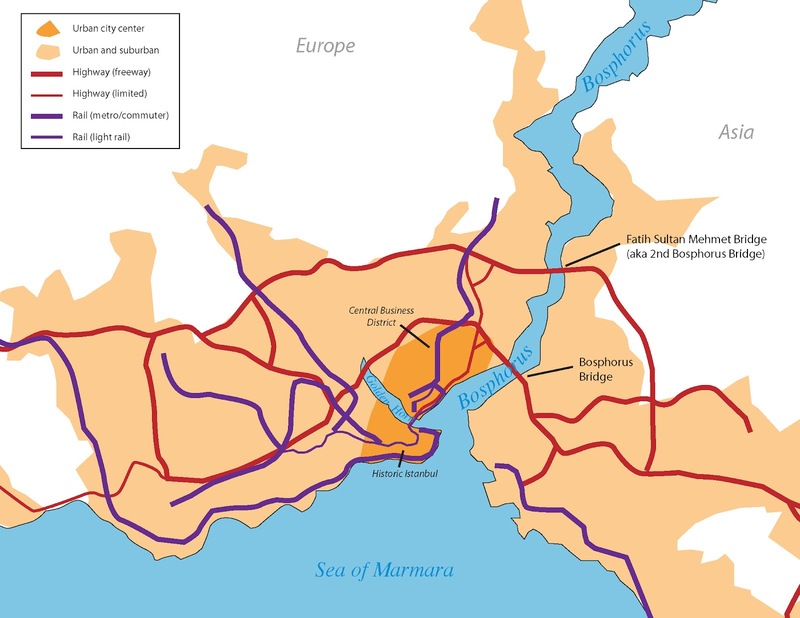 The idea of a Bosphorus Bridge is often attributed to Nuri Demirağ, a wealthy industrialist of the early Turkish Republic. Inspired by the construction of San Francisco’s Golden Gate Bridge, Demirağ imagined cars zipping across a suspension bridge as early as 1931. But the project was put on hold mostly because it didn’t make economic sense. Turkey’s first census in 1927 put its population at just under 700,000 — compared to 1 million in 1920, when the city was under British Occupation. The Turkish Republic had moved its capital to Ankara in 1923 and the city of Istanbul still needed to grow into its own bones. All the same, Demirağ’s construction fantasy was quite literally a national dream. He was a railroad magnate who believed in a self-sufficient and modernizing republic. Men like him were to be the face of the new Turkey. A 1930s-era cartoon compares a balding, bespectacled engineer imagining a Bosphorus bridge to an Ottoman pasha from the century before, sucking on a water pipe from under his giant nose and lusting after roasted meat. The Turkish Republic was modern, and infrastructure was modern. Therefore the Turkish Republic was infrastructure. However, neither the money nor the necessity existed to turn this formula into action until after World War II. Turkey was the recipient of Marshall Fund loans from the United States and aligned with NATO in 1952. 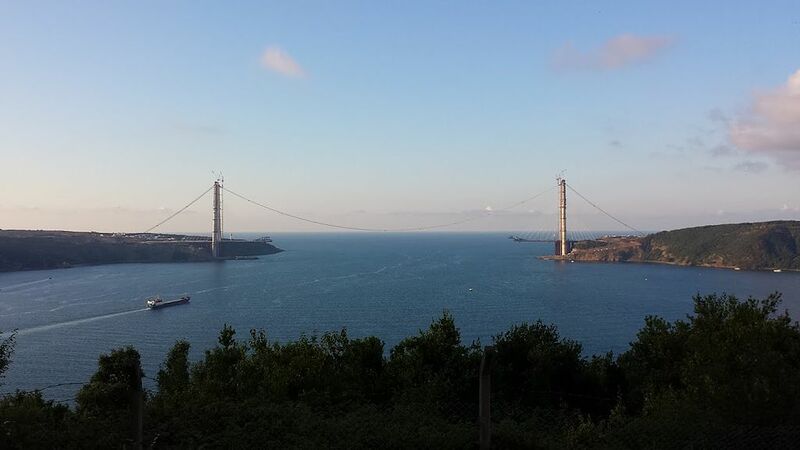 The Bosphorus Bridge project was reopened the next year. Turkey was hardly alone in witnessing the rise of a technocratic elite in during the Cold War. What was remarkable was how well the technocrats worked. It would be easy to find a military motive here, as one could imagine American generals wanting to ensure a road connection with their nuclear base in Izmir and their Turkish counterparts desiring a clear avenue for reinforcements along the long Soviet border. But it would also be unnecessary. The country was run by engineers who promised citizens new roads and by businessmen who wanted their products on those roads. Suleyman Demirel, a civil engineer-turned-Prime Minister, signed an agreement with British firm Freeman, Fox and Partners in 1968 to build an intercontinental bridge from Ortakoy to Beylerbeyi. In the 1960s, Istanbul politicians closed down its tram services and expanded the city’s road network for a population that climbed over 1 million for the first time since a sultan presided on the shores of the Bosphorus. In 1970, a visitor to the last Ottoman palace at Dolmabahçe could watch the stark lines of a modernist bridge go up three kilometers away. And when the bridge finally opened in 1973, it was a modern marvel. The grand opening was led not by Prime Minister Demirel but President Fahri Koruturk — a man so apolitical that he had been ambassador to both the Soviet Union and Francoist Spain. According to Milliyet, hundreds of thousands of Turks (and 500 journalists from around the world) joined him from both Europe and Asia. The paper also provided insets on how to use the onramps and pay tolls. A thousand-lira banknote from the late 1970s depicting the Bosphorus Bridge. While this note was in use, its value fell from about $11 US to less than $1. Istanbul is a city built on thousands of years of history. And here, across the Bosphorus, was new land to walk on. Elsewhere in the city, people could protest razed working-class neighborhoods, looted stores, and overturned graveyards. People did. But the bridge was something entirely new. This is a remarkable thing in a city as old as Istanbul. It didn’t take long for people to try and hang protest banners off the side and over the Bosphorus. It didn’t take much longer for the municipality to ban pedestrian traffic from the bridge. In the rising violence of the 1970s, left-wing radicals took to Taksim Square to speak to workers. 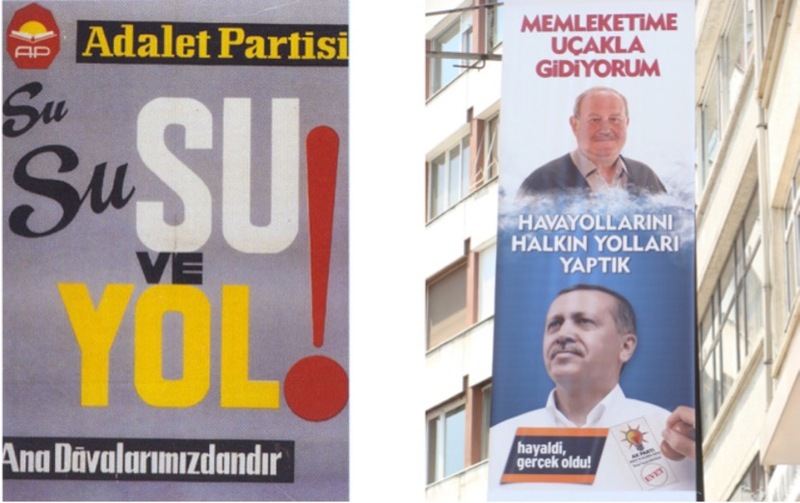 Prime Minister Demirel’s party spoke to what workers created, plastering his party’s white horse over depictions of the Bosphorus Bridge in his political ads. Istanbul’s second bridge (which was also occupied by the military in 2016) was much more political. It was constructed in 1988, after Turkey’s third coup d’etat violently quelled uprisings throughout the country. It soared over a mansion once owned by the sultan and buzzed past radicals smoking cigarettes on the campus of Bogazici University. The second bridge explicitly conquered space. It was even in the name: the Turkish rulers of the 1980 deployed a proud Ottoman and Muslim past in an attempt to obtain the unity that modern liberalism failed to do. The second bridge was named after Mehmet the Conqueror. Fatih Sultan Mehmet Bridge from Rumeli Hisari. 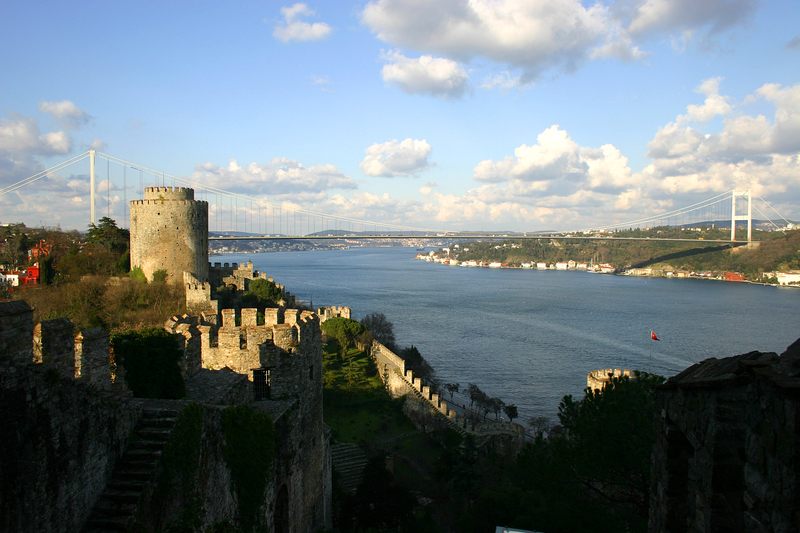 The 15th century fortress was built at the narrowest point of the Bosphorus, which is why a bridge was imagined there well before the first Bosphorus Bridge was built. A third bridge is under construction in Istanbul’s far north. It shall be named after Sultan Selim the Grim, who received the moniker due to his destruction of heterodox Muslim communities. It should be complete by the end of 2016 and is incredibly contentious. Detractors say that it will destroy the Belgrad Forest, Istanbul’s largest green space. Proponents say that it is necessary for a modern country and a growing economy. The third bridge under construction. Much of the greenery surrounding it will soon be destroyed by urban development. Unlike these two, the Bosphorus Bridge is understood to be simply infrastructure. In a city where nothing can be built without kicking over a grave – see the Armenian cemetery at Gezi Park, or the Byzantine port at the Marmaray tunnel – a bridge soaring above the water represented untrammelled space. Banning pedestrians from the bridge kept it this way. The ban also made the annual Istanbul Intercontinental Marathon enough of a celebration to tamp down mass protest. The race is traditionally followed by a “people’s march” who follow in the athletes’ wake. Sure, there are flags and banners. But most Turks consecrate the ground in a more prosaic manner. When marchers arrived, the bridge – like nearly anywhere else in Istanbul, given enough time – became covered by portable grills and games of backgammon. This July, Istanbul’s first bridge became a space of contestation for the first time in its 43 years. It remains unclear what the heck the orchestrators of the coup were thinking, but it seemed like by shutting down the city’s infrastructure they were hoping to bring the city itself to a halt. An attempted coup is…not like that, of course. But if it seems odd that a military force and popular protests have taken similar actions, it is worth looking at what they are taking action against. People attach meaning to the spaces built to erase them. One of the most effective of Recep Tayyip Erdogan’s moves since ascending to power has been to incorporate his party into the formula of “Turkey = infrastructure.” New highways crisscross the country and posters across Istanbul proclaim how quickly one can now traverse an ever-expanding city. Binali Yıldırım, the man publicly mulling a name change for his country’s grandest infrastructural project, came up through the Ministry of Transport. 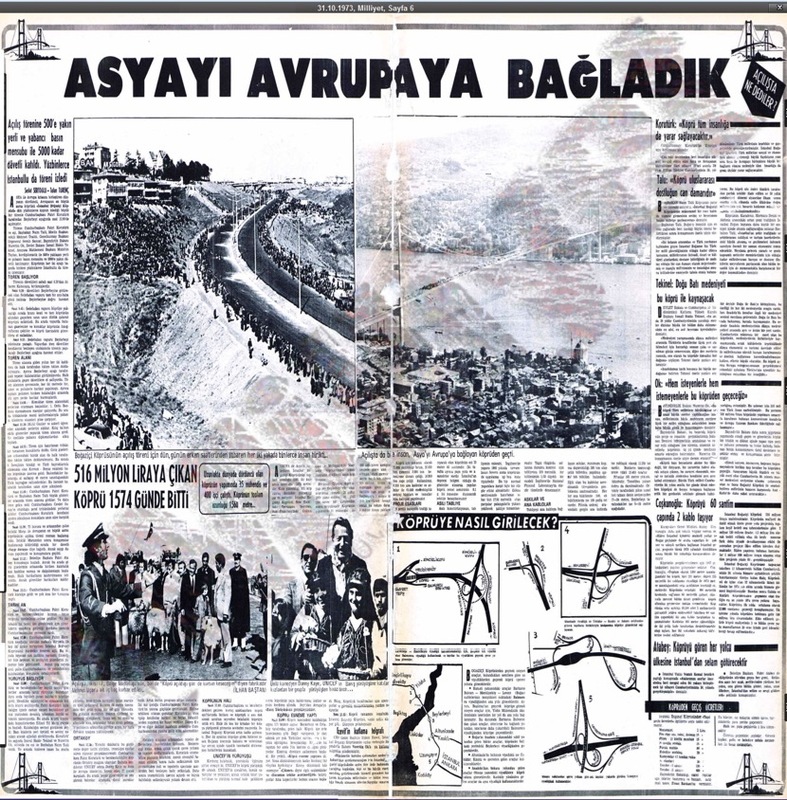 Back in the 1970s, Suleyman Demirel’s Justice Party campaigned under a promise of “water and roads.” Today, Erdogan’s Justice and Development Party actually delivers them both. In the 1960s, the Justice Party advertised “water and roads.” In the 21st Century, the Justice and Development Party built on that by promoting the several regional airports built in Turkey. Source: North Caucasus Caucas. For a general who has been indoctrinated to believe that the Turkish army is the protector of modernity, seeing a devout and often nostalgic political force become the face of modern Turkey must be more than infuriating. For the military officer, as for the activist, a bridge is more than a concrete mechanism to get from point A to point B. It is a political claim to space. More than that, it is a claim to which spaces are important. 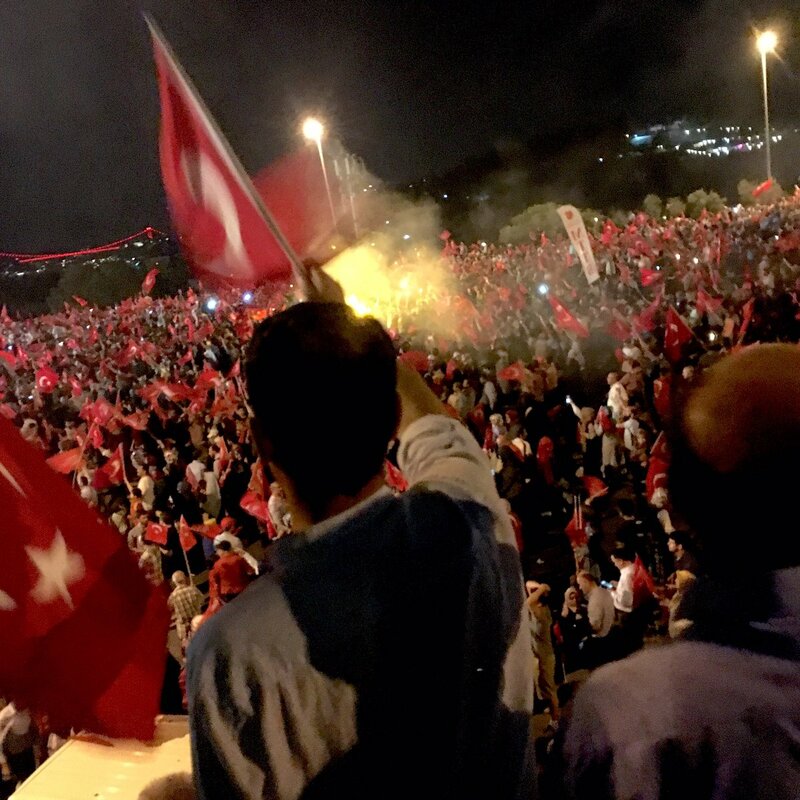 On July 21, six days after the failed coup, thousands of Turks took to the Bosphorus Bridge in that semi-spontaneous way that crowds form in the age of social media. According to one Turkish journalist, they sang old-school leftist protest songs but with lyrics reworked towards religious or nationalist ends. 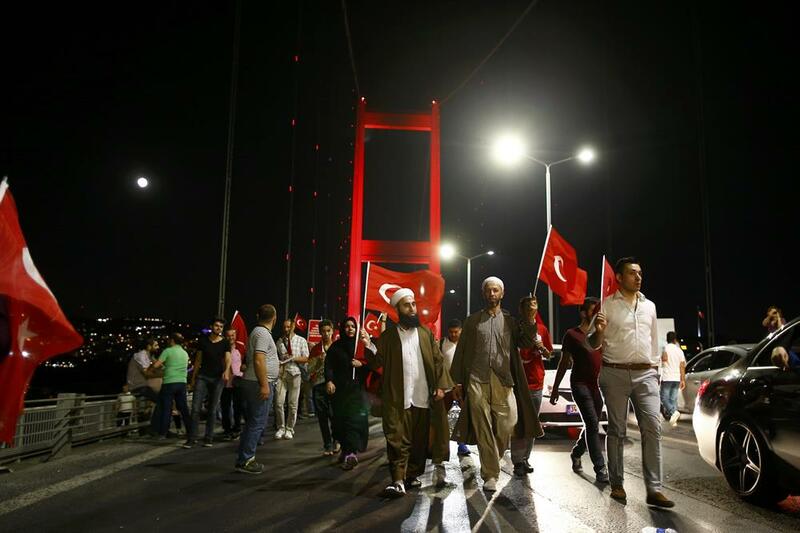 Protesters on July 21 on the Bosphorus Bridge. It was beautiful in the way that giddy crowds are always beautiful. They looked like they were celebrating a World Cup victory, or maybe two.. The crowd seemed willing to ritually cleanse the bridge from the blood of July 15. This is meant not in a pejorative way to mock the religiosity of the crowd, but rather to try and make sense of a joyous celebration six days after harrowing violence. The Bosphorus Bridge can no longer be a symbol for something as simple and optimistic as national modernity. It can no longer represent brilliant engineering, overlong taxi rides, or a contrapposto to the elegant Ortakoy Mosque. Bosphorus Bridge is now insurrectionary space. The six-day-late singers were almost too perfect of a metaphor; bringing new meaning to old tunes in an attempt to redefine their relationship to modern Istanbul. Asher Kohn writes about land use and disuse. He is an editor for Ajam Media Collective. I really loved the piece and your take on of the transformation of the Bosphorus Bridge from an infrastructure project and tabula rasa to a social and political ground. But the coup attempt does not mark the first time for the bridge to have political meaning. During the action-packed days of Gezi Protests back in June 2013, around hundreds of people took the Bosphorus Bridge to get to Taksim Square from the Asian side. And actually this happened two times, firstly at the very beginning of the protests before the park was occupied by the people on 1st June and secondly just after police raided the park on 16th June.